Built in 1981, by the Louis G. Ortis Boat Company of Krotz Springs, Louisiana (hull #130) as the Betty for the Republic Towing Corporation of Houston, Texas. In 1984, the tug was acquired by McDonough Marine Service Incorporated of New Orleans, Louisiana. Where she was renamed as the Mister Mac. In 2000, she was acquired by Henry's Marine Service Incorporated of Morgan City, Louisiana. Where the tug was renamed as the Capt. Blake Henry. 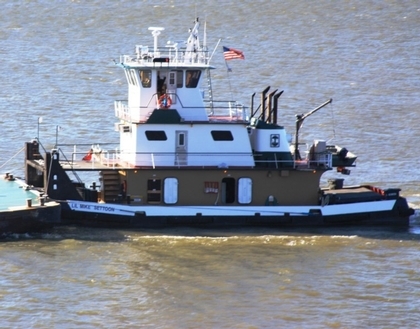 In 2005, the tug was acquired by TK Towing Incorporated of Morgan City, Louisiana. Where she was renamed as the Vicki Lynn. In 2011, she was acquired by Settoon Towing Incorporated of Pierre Part, Louisiana. Where the tug was renamed as the Lil' Mike Settoon. In 2017, the tug was acquired by Savage Marine Services Incorporated of Salt Lake City, Utah. Where she was renamed as the Savage Mentor. Re powered in 2012, she is driven by three, Cummins KTA-M1 diesel engines. With Caterpillar reduction gears, at a ratio of 6:1. Turning three, stainless steel, fixed pitch propellers. She is a triple screw towboat, rated at 2,000 horsepower. Ship Builder: Louis G. Ortis Boat Co.